Apologies in advance if this is in the wrong place, there isn't a geography StackExchange so this was the next best option I could find. I've read multiple things about the huge size of King Khalid Internaional Airport (IATA: RUH, ICAO: OERK) in Riyadh, one source said it was bigger than Paris and others have said it's larger than the entire country of Bahrain. Judging from Google Maps, it really isn't particularly big. What's the deal with that? 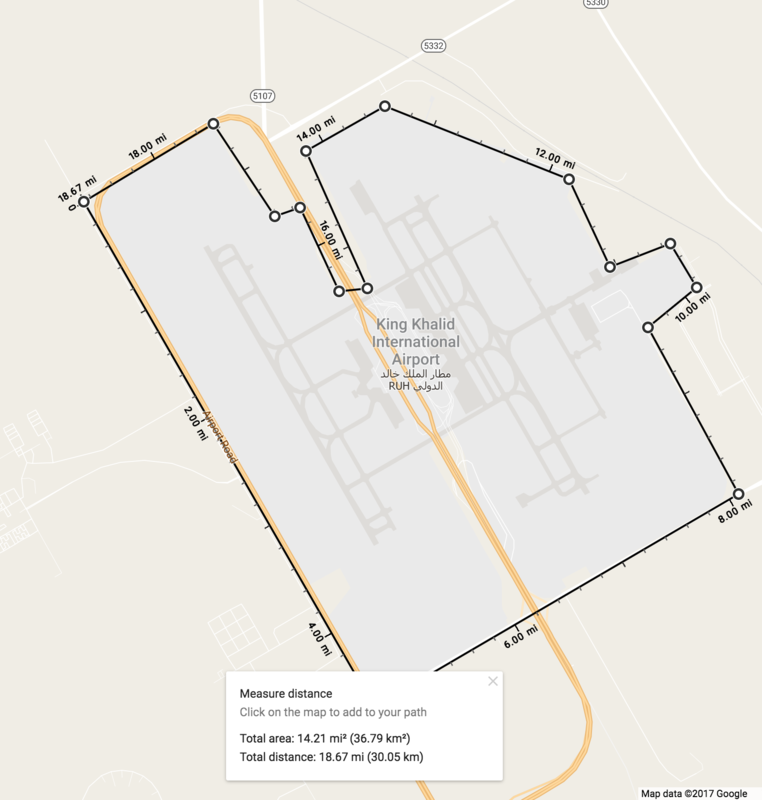 The King Khalid International Airport (234 km^2) is larger than Paris proper (160.0 km^2). 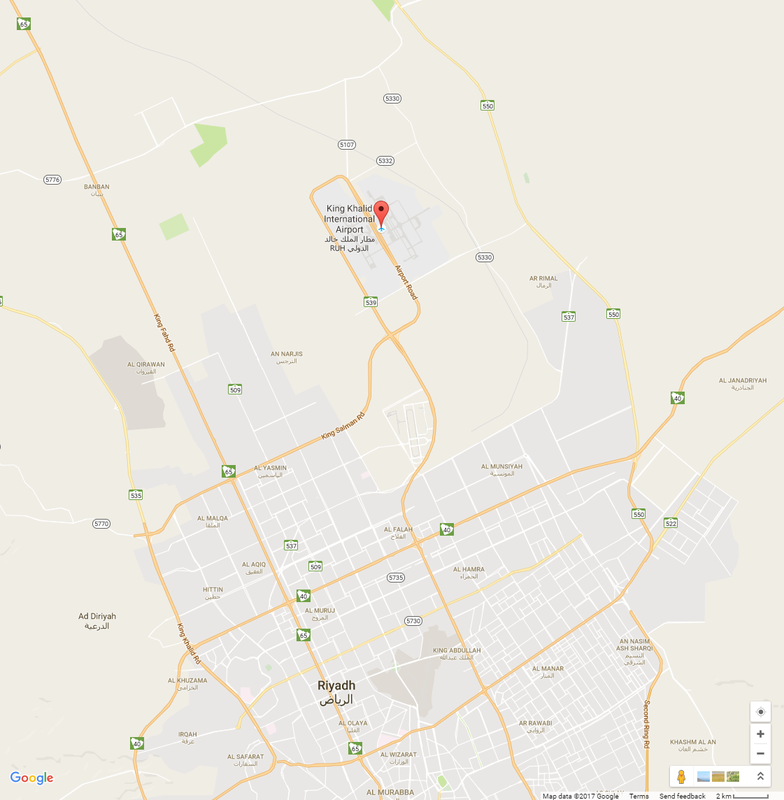 The King Khalid International Airport is not larger than Bahrain (762.8 km^2). To arrive at this answer I used some data from various sources. Mostly non-official but dependable sources as I do not have the language skills to navigate Arabic websites. I pulled street data from OpenStreetMap and using the very good find by the community wiki response georeferenced the future land use map with points using the polyline data. Georeferencing is used to correctly orientate and scale raster images to geographical locations. I then created a new feature using the rubbersheeted/georeferenced land use map to draw the rough outline of the land that could be used for airport activities; this is the land dedicated to airport use not necessarily the actual size of the facilities. This should give us a rough idea of the size and shape of the airport. 234 square kilometres. Using data of the administrative districts for Paris, I summed the area of the 80 districts for Paris proper. 160.0 square kilometres. 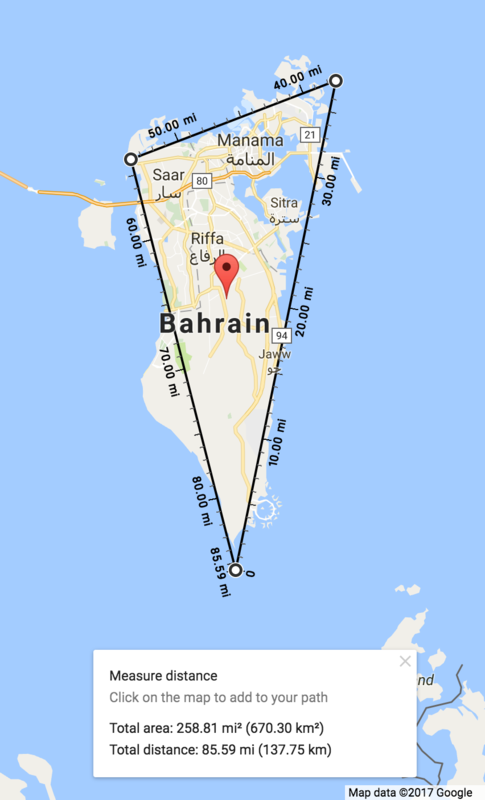 Using ESRI's shapefile for world nations, I found the area of Bahrain. 762.8 square kilometres. 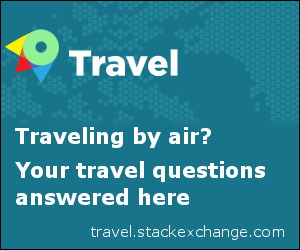 If you enjoy maps, come on over to the https://gis.stackexchange.com/. It is probably the closest to pure geography on SE yet. It depends how you define the airport. I don't think your Google Maps method is sound, however; it depicts built-up areas, not the airport boundary. You couldn't draw the same map around LAX, say. The standard for measuring the area of an airport appears to be the total land owned by the airport. And jet age airports, with their expansive noise buffers and office park reservations, tend to take as much as they can get. DEN is reckoned the largest airport in the U.S., at 33,531 acres (~136 km²), though only a fraction of this is developed. The numbers for total land are easy to find, the numbers for improved land less so, but I found an informative Globe and Mail article about Montreal-Mirabel. When originally created, the land seized for the airport was larger than the city of Montreal itself— around 97,000 acres (~392.5 km²). 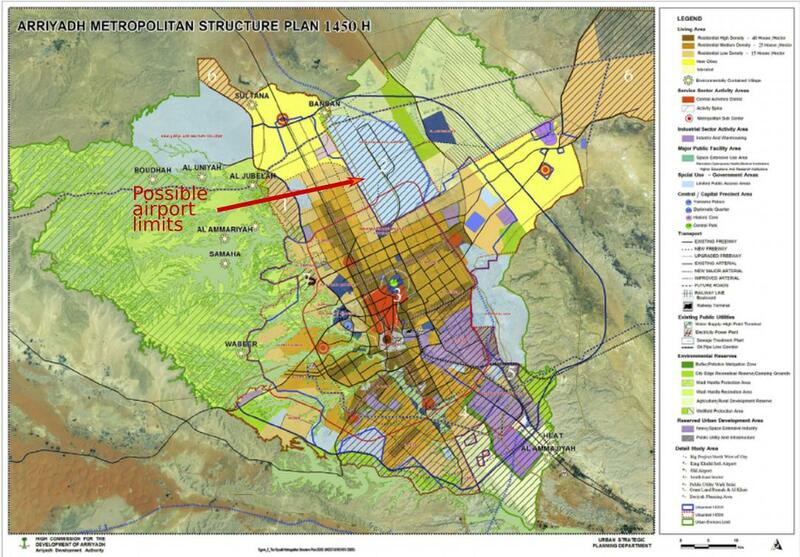 The article notes that the airport perimeter itself was only about 5,200 acres (~21 km²). Still, it's the former number that is commonly bandied about, and the measure by which Mirabel was considered the largest airport in the world. 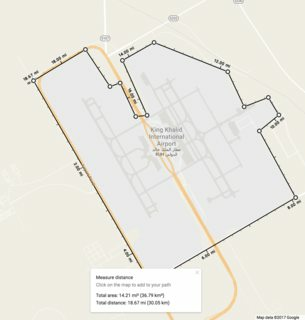 According to Kable, a London-based business information firm, King Khaled International Airport covered an area of 225 km² when it opened in 1983. In 1999 it was surpassed by King Fahd International Airport, which occupies 776 km². This is roughly the figure given by the 2013 Guinness Book of World Records. It might help to have citations for the claims you mention - perhaps there's missing context. 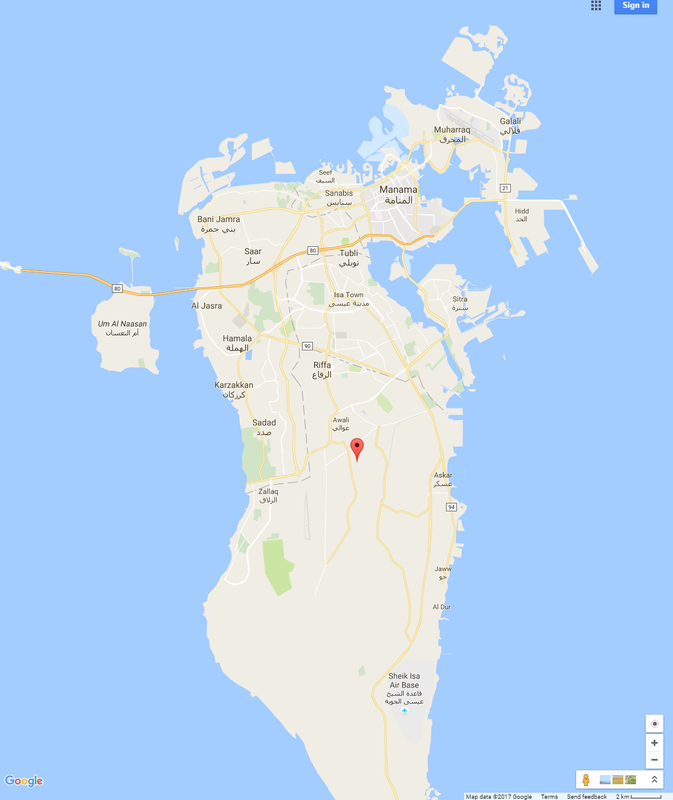 Click to embiggen the images, but they're not remotely close: Bahrain's total area is around 700km²; OERK airport according to Google measures closer to 37km². 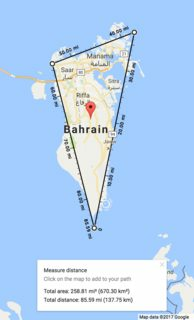 It's not even necessary to closely follow the Bahrain coastline to get a precise figure, the numbers are so far off. The airport occupies an area of 375 square kilometres (93,000 acres). It seems likely but not guaranteed that this could be due an omitted decimal (37.5km², not 375km²) or to unscrupulous edits. Even so: if it were 375km², it would only be larger than the administrative center of Paris (105km²); it would remain smaller than Bahrain. EDIT: that seems likely. Back in 2013 an anonymous user added that its area was 300km² and the airport's size has, at least in print, steadily increased since then. I imagine if you did some more forensics you'd find that this is all random IPs. Other clues may be discovered in the same page. The cadastral information is handled by MOMRA. The company that surveyed this area may be Twozan. This is a "community answer", so feel free to improve it. In terms of size of the terminal and movement areas, it's not very big at all for an international airport. Even medium-sized passenger airports in the U.S. are commonly larger than Riyadh's airport. It has only 2 parallel runways and 24 boarding bridges. By comparison, the medium-sized airport I usually fly out of in the U.S. has 36 boarding bridges, 3 parallel runways, and an additional crosswind runway. The busiest airport - Atlanta International - has over 200 boarding bridges and 5 parallel runways in simultaneous use. In terms of land area, especially land area owned by the airport rather than just what it actually uses, it is indeed quite a bit of land, though that's not necessarily unusual, especially for newer airports built in places with a significant amount of available land. Airports generally like to buy up as much land as feasible in order to have room for future expansion. Many of today's large airports are now space-constrained as the cities they serve have built up around them since the airport was originally built. Airports that can try to buy up land that they might possibly need in the future in order to prevent running out of space to expand. In terms of passengers per year, Riyadh's airport is relatively large, but nowhere close to the world's largest hub airports. In 2015, Riyadh served 22.5 million passengers. By comparison, Atlanta had 101.5 million. The 50th-ranked airport was Minneapolis/St. Paul International at 36.6 million. So, by passenger traffic, Riyadh is probably somewhere around 100th worldwide, though exact rankings below 50th aren't made public by ACI. Not the answer you're looking for? Browse other questions tagged airport airport-design or ask your own question. Could New York build a new mega airport? What FAA regulations govern a US International Airport name change, such as McCarran International to Harry Reed International?